There is so much confusion among students applying for KGSP (Graduate and Undergraduate) and other Korean scholarships about the importance of TOPIK test score in the selection process. Will a TOPIK (Test of Proficiency in Korean) score help me get a Korean scholarship? 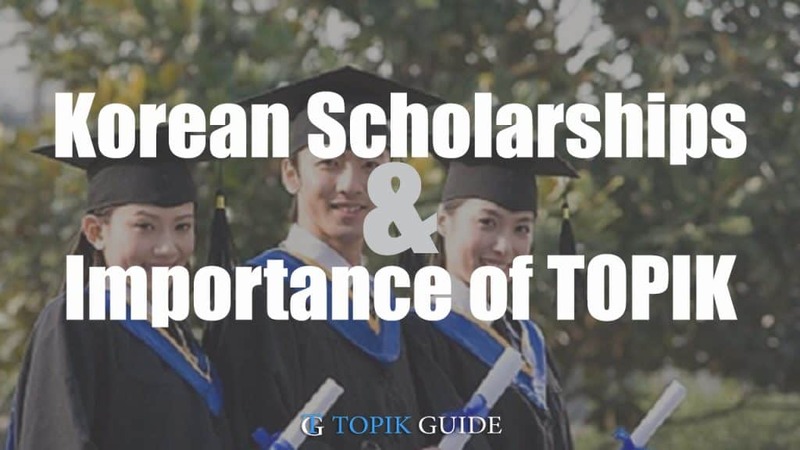 How important is TOPIK score in the selection process for scholarships / admissions? Can I apply for KGSP or other Korean scholarships if I don’t have a TOPIK test score? Is a minimum TOPIK level mandatory to get admission in a Korean university? Will TOPIK level 5 guarantee me a Korean scholarship? My Bachelors/Masters classes will be conducted in English. Do I still need to learn Korean and pass TOPIK? In this post, we are going to answer all these questions. Let’s first understand that there is no fixed rule about TOPIK test requirement. It totally depends on the university or scholarship. Some universities require a certain TOPIK level to get admission but if you apply for a scholarship that is funded by an outside source (like a Korean government scholarship), generally the rules of that scholarship get priority and universities admission rules are secondary. Every Korean scholarship has its own rules and guidelines and you should check them before contacting the university. For example KGSP does not require you to have a TOPIK score before applying. Though having a TOPIK score may help you and they may give you priority but it’s definitely not necessary. Most of the scholarships have a Korean language training component. They require you to go through a Korean language training program after you are selected and land in Korea. They may require you to pass a certain TOPIK level after completing the training. If you are not able to do that, they may refuse you admission to main course (Bachelors or Masters). KGSP requires you to pass at least TOPIK level 3 after the training. So if you are applying to an university under KGSP, you are not required to have TOPIK even if the university follows a rule that mandates having TOPIK score to get admission. When applying for a scholarship, check the guidelines carefully and if you are confused about TOPIK requirement, contact the application in-charge. They always give the contact person’s email and phone number in the application details. Similarly when applying to a Korean university directly, you can always email or call the the department, admission office or office of international affairs and ask them to clarify the requirements. But why are more and more Korean universities asking for TOPIK test score? The reason is that, most of the classes in Korean universities (even in top universities like SNU and Yonsei) are conducted at least partially in Korean. Even if the classes are in English, sometimes some study resources might be in Korean, certain assignment guidelines may be in Korean. Or the department may send their notices and other information in Korean. And most of your classmates will be native Koreans who may not be very comfortable communicating in English. So to pursue your study smoothly there, you need a certain level of Korean knowledge skills. Korean universities don’t want you to be stressed due to language barrier because ultimately it will affect your studies. From my personal experience, one should have at least TOPIK level 3 to pursue any kind of academic work in Korea. If your department conducts classes completely in English and you are sure that all your project work will be in English (like in GSIS or some science/engineering departments), you should be Okay with TOPIK level 2. But I would recommend everyone to learn some Korean (at least TOPIK 2 level) if you don’t want to feel left out in your class/lab. If you already have TOPIK level 3-5, you may get priority in selection as they will not have to spend time and money on your Korean language training but it’s not always the case. They review the academic records, study plan and recommendation of the candidates and if someone is a much stronger candidate than you in those aspects, they may prefer them even if they don’t know Korean at all. So, No.. Having TOPIK level 3 or even 6 does not guarantee that you will get a Korean scholarship. But yeah, you definitely have a better chance. If you are learning Korean at some institute or university or through self-study, I would strongly recommend you to start preparing for the TOPIK test with the right study material.